WHAT?!? 5/1/12 | Sorcerers Of The Magic Kingdom: The Blog! I was doing my daily surfing on eBay when I came across this monstrosity. 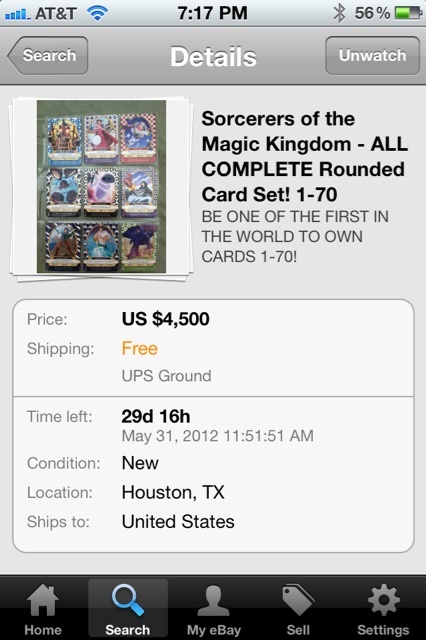 This entry was posted in News/Rumors, Opinions and tagged 61-70, beta cards, disney, ebay, hints for sorcerers of the magic kingdom, Lightning Bolt, round corners, sorcerers of magic kingdom strategy, Sorcerers of the Magic Kingdom, sorcerers of the magic kingdom card combos, sorcerers of the magic kingdom combos, SOTMK, spell cards, Walt Disney World, WDW by sotmkblog. Bookmark the permalink. It’s a jaw dropping number, but you’re right. There is a fool that will pay. Also is this the same Ben, I know? I met a nice family of 6 during the testing phase. They had stacks of cards and all the lightning bolts. (They weren’t rare then, we all got them) I wonder if this is them. I can’t remember where they were from, but they gave me my Bolt card.